Butterflies dancing around flowers is a good sign in Chinese culture because the good scenery indicates that spring has come. Most importantly, the good fortune will follow. Therefore, butterflies and flowers are usually used as good signs of blessing. Of course, they can be used for your wedding. 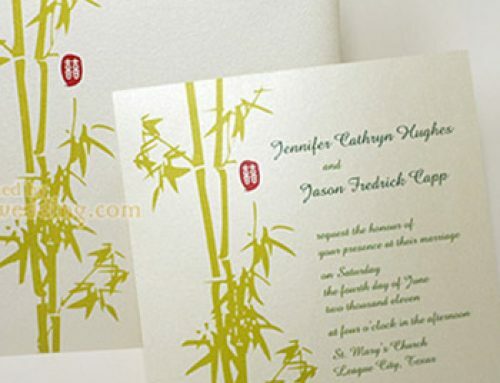 It will also be a good idea to have them in your wedding invitation design. 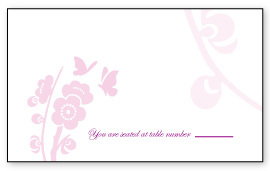 Both butterflies and cherry blossom can be seen in this invitation design. The design of it is not fancy. There are two butterflies flying on the card. Without any surprise, the two butterflies signify the bride and the groom. The bride and groom are flying happily together. 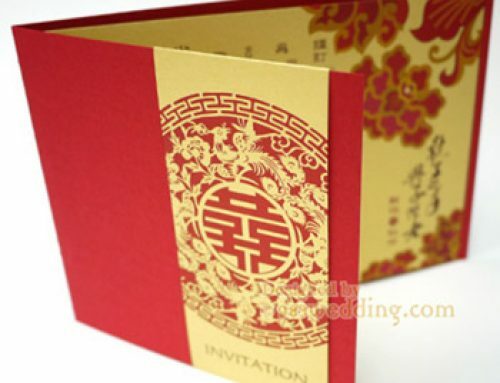 Besides, cherry blossom patterns are extensively used in wedding invitation designs. Combining these patterns with the butterflies is certainly a blessing. The main color scheme of the card is pink and purple. As mentioned, the design is not fancy. This is why we do not make the design extremely colorful. 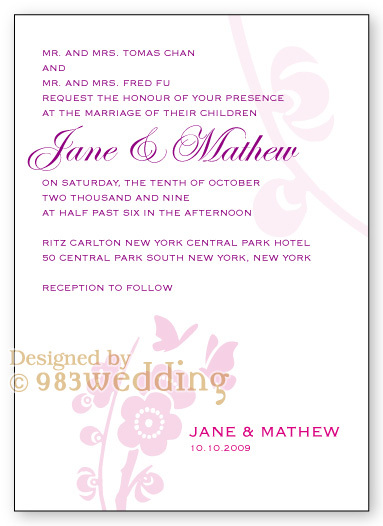 Only pink and purple colors are printed on a piece of white color paper. The patterns are all printed in pink while the wording is printed in purple. 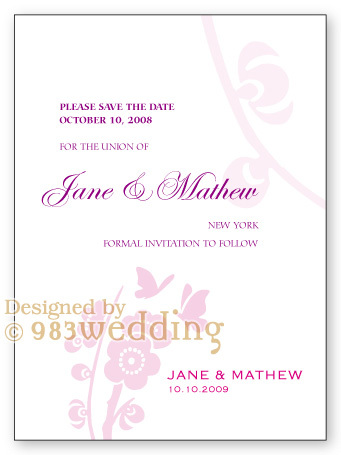 The names of the couple are printed in a pink color which is a bit darker than the one used for the patterns. 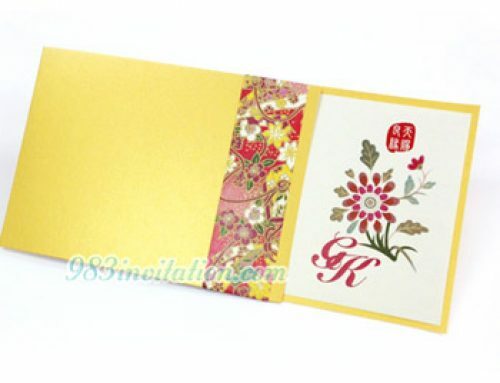 To make sure that the card will not look too busy, we do not try to put a lot of cherry blossoms on the card. 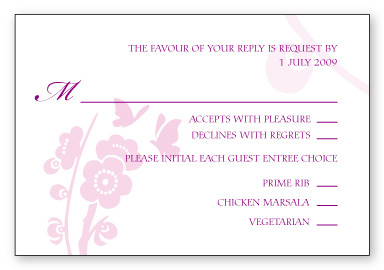 Since this is a single panel wedding card, you are advised to print one language only. We will need to print the wording on both sides of the card if a bilingual invitation is required. 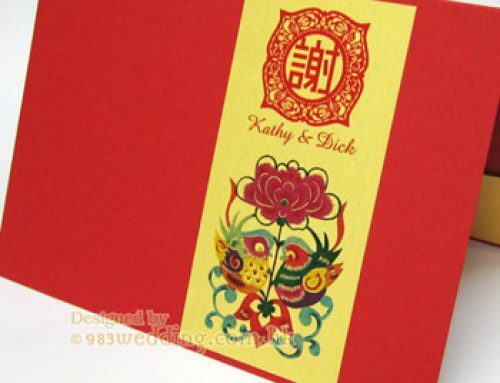 Other stationery items can also be printed in order to create a uniqueness of the design. Cover with full color printing. 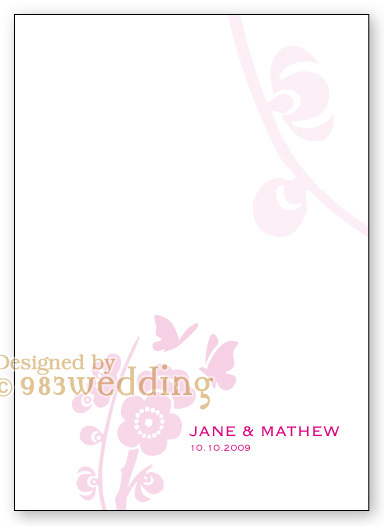 Below are the illustrations of the whole set of wedding stationery. 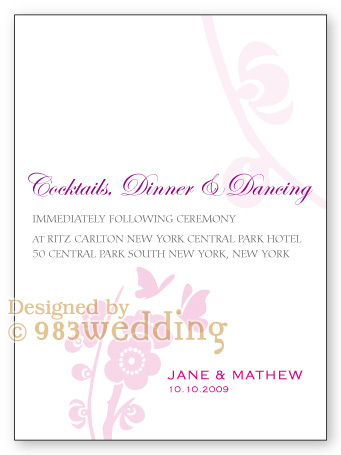 They include the main wedding invites, save the date cards, reception invitations, thank you cards, reply cards, and place cards. 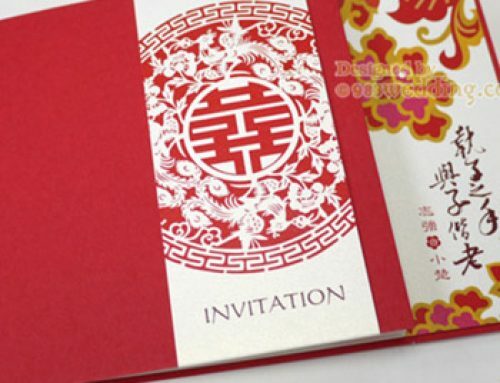 The color scheme and design are of course the same as the main invitation. We can also create other items using the same design for you. Please contact us for further discussion.